A review requested by Chris D, with thanks for contributing to the Second Quinquennial Antagony & Ecstasy ACS Fundraiser. "It is not enough to begin at the beginning. We have to go before the beginning, to 1995, when the 26 episodes of Neon Genesis Evangelion started to air on Japanese television. Telling the story of how skyscraper-sized humanoid biological robots called "Evas", piloted by emotionally damaged teenagers, fought off the onslaught of huge trans-dimension or extra-terrestrial or Christ knows what kind of creatures called "Angels", the show was an enormous hit. It was also a costly show, and one that took a turn near the end from subtly exploring emotional trauma to openly depicting creator Anno Hideaki's battle with depression. For these reasons, the last two episodes ended up in a place infinitely different than anyone might reasonably have expected it to end based on at least the first half of the show's run. And there were riots, literal actual riots with outraged fans defacing the building that housed Gainax, the studio which produced the series. Two years later, Anno responded to his baffled and enraged fanbase by remaking the last two episodes as the theatrical feature The End of Evangelion, and in the process doing basically nothing to actually provide them with more clarity or closure." And now that we're all gathered together to take a closer look at The End of Evangelion, released in 1997, about sixteen months after the enormously controversial final two episodes of the series aired. Those episodes, "Do You Love Me?" and "Take Care of Yourself", were the result of an animation team that had basically run out of resources by the end of the series' 26 episodes. Which meant that the resolution vast story of emotionally broken young people serving as the human weapons in the battle between a corrupt, monstrous paramilitary conspiracy and the unknowably inhuman beings of ancient spirituality made flesh, both trying to bring about the end of the world in different ways and for different reasons, had be done using impossibly limited animation and abstraction. 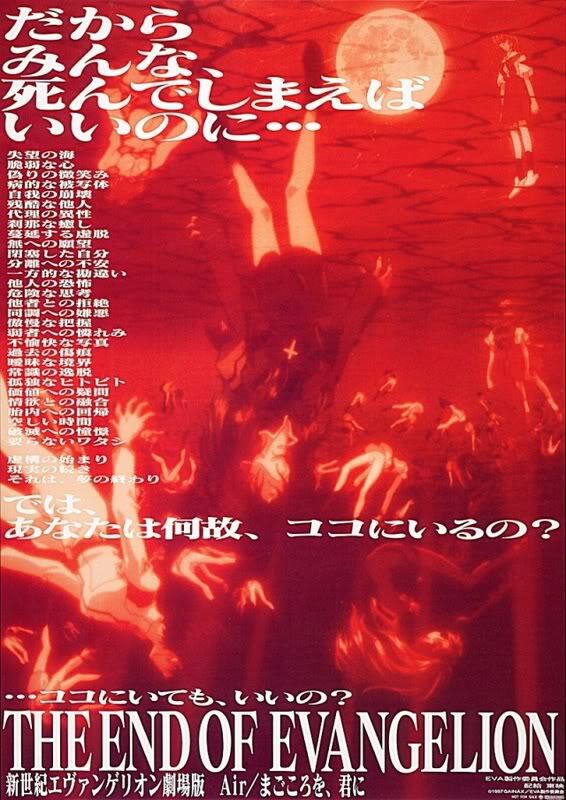 In practice, this meant that the last two episodes of the series are wholly subjective, taking place entirely in the mind of Ikari Shinji (Ogata Megumi) during the events of the Human Instrumentality Project, which are thus described only implicitly and second-hand while the main plot is an inside-out attempt to explore the nature of Shinji's self-hatred and depression, and his conscious desire to isolate himself from humanity. I am now speaking entirely for myself: I really loved those last two episodes. They bend and break the medium of episodic television in astounding ways, and depict Shinji's mental state from an artistic angle that I can't compare to anything else. But I get why they infuriated such a huge percentage of the Evangelion fanbase, and why Anno took the first opportunity he had to return to his original conception for the last two episodes, approximately doubling them in length to serve as the two halves of The End of Evangelion, "Love is Destructive" and "ONE MORE FINAL: I Need You" (which are presented as two discrete 45-minute segments, each with their own ending credits and all). The starting point of the film - which absolutely refuses to function on any level whatsoever if you don't know the 24 episodes preceding it in relatively close detail - is Shinji's abyssal sense of loss after being forced to kill Kaworu, a boy of apparently his own age who turned out to be the Final Angel. Kaworu was the first individual Shinji had met over the course of the series who befriended him without judgment, requiring anything of him, or layering that friendship in with a measure of abuse and hatred. So when we show up, Shinji is almost totally incapable of functioning. Specifically, he's standing at the bedside of Asuka (Miyamura Yuko), the girl he has a crush on despite her unbridled arrogance, who has been in a coma ever since her own recent encounter with an Angel gutted her mind. Begging for her to absolve him of the lives he has been responsible for ending, he masturbates over her body after accidentally dislodging her gown to reveal her breasts. Our hero, ladies and gentlemen! The first two-thirds of The End of Evangelion proceed to be exactly the promised resolution to the story that Gainax marketed it as being. The events surrounding the Final Angel has precipitated a final break between NERV (the organisation that runs the Evas against the Angels, and has been positioned by its leader, Shinji's father Gendo (Tachiki Fumihiko), for his own cryptic ends) and SEELE (the international organisation that thought it wan NERV), the latter sending the Japanese Defense Force to kill all the people inside NERV headquarters, good and wicked alike. In this battle, Asuka and Misato (Mitsuishi Kotono), who has served as Shinji's cheerleader and big sister, both die, and Gendo attempts to trigger the end of all things - the Third Impact - by merging Rei (Hayashibara Megumi), a clone of his dead wife, with the preserved corpse of Lilith, the Second Angel, and the progenitor of all humans and Angels. So even by the end of that little recap, the opaque spiritual mythology that was at no point the strong suit of Neon Genesis Evangelion starts to get a little out-of-hand, and any pretense this has to being the clear-cut "let's just explain things" version of the story that the fans who'd rebelled against the given finale of the show were hoping for disappears completely. It's also the point where The End of Evangelion starts to get really terrific: the second half is very much like the last episode of the show, in that it's mostly a subjective record of what Shinji thinks and feels as he becomes the only human consciousness in existence to not merge with the rest of humankind during the Third Impact. Only where the show could only explore this psychological abstraction using the most desperate cost-cutting measures possible, the movie gets to play with a budget of some considerable scale - not like the sort of money Disney got to play around with in the '90s, not even tremendously expensive by contemporaneous anime standards, but certainly enough to realise Anno's difficult ambitions at a level that even the most complex moments in the series couldn't begin to dream about. All of the parts of The End of Evangelion that are the best are those which are most subjective, save one: the final, doomed battle between Asuka and the synthetic Evas operated by SEELE is a beautiful marriage of Bach with animated action, a pageant-like sequence that's somewhat conventional but wonderfully evocative. But everything else that's most striking, and not simply an exercise in mecha anime done on an enormous scale, is when the film enters a character's mind and skews the medium around what it finds there. This starts reasonably early: there's a montage that depicts Asuka's realisation that she wants to survive and fight, and it's something of a learn-by-doing experience for the audience to understand how the fragmented, symbolic elements of the film are going to work. It's a mere warm-up for the last 30 minutes or so, in which Shinji's mind becomes, once again, the staging ground for the climax of Evangelion. The sequence in which he witnesses the ascendance of Lilith is stunning enough, nightmarish imagery presented in a reasonably coherent fashion, but the best material is all crammed to the end, when the editing speeds up at a breakneck pace - at one point, the entire series is synopsised in a series of flash cuts last at most a frame or two, presented for - and where the aesthetic switches into computer animation, pencil tests, still drawings, only ever for a second or two. Towards the end, the sound starts to fragment alongside the imagery, and what we've left with is less of a movie than a visual game of word associations; it's like the animated version of the Beatles song "A Day in the Life", and it's altogether some of the most fearless material in Japanese animation. What I have basically sketched out, then, is the argument that The End of Evangelion gets really exciting at exactly the moment it becomes most slippery and impossible to parse without a notebook in one hand, the entirety of the series including the two "superceded" episodes in the other, and a collection of Jewish mysticism in the third. The accurate implication would be that the first part of the movie isn't quite so exciting. It's solid. The animation is at least a half-step above anything in the show's waning period (when the budget started running out), and the voice acting is rich with the naturalism of people who knew their characters inside and out and didn't have to overwork lines to find the emotion in them. There are individual shots that are absolute killers: Asuka's EVA-02 lying a helpless silhouette, at the bottom of the frame, pinned from every angle, the close-up on Misato's face as she bleeds out, anything involving Lilith-Rei. And at its very worst, the film is still an awfully good sci-fi anime, which is by no stretch my favorite category of animation, Japanese or otherwise, but I can still see it being good when it's staring me in the face. Even so, the film is best when it transcends genre, when it becomes a representation of anger, depression, embarrassment, and fear that rips apart animation from the guts and reassembles it according to a brand new set of rules. Too much of it strikes me as too "normal" for it to be a particular landmark in the history of the genre, but at its best moments, it is absolutely essential. Categories: action, animation, japanese cinema, science fiction, what the hell just happened?